There are no bulletins yet. Known also as Red Rivers Trail Riders, with rides based in the Logan, Scenic Rim and Redland Shires....our Clubs activities and rides calendar is as diverse as the regions we ride! In 2001 two ATHRA affiliated Clubs which operated with the same values and utilized similar riding areas merged to form the Logan Rivers Redlands Trail Riders Club. These were the Redlands Horse Trail Riders Club which had a history dating back to the inception of ATHRA Qld, and the Logan Rivers Trail Riders which was a seven year old Club. The concept was to form a stronger Club with a broader cross section of members who had a diverse local knowledge of areas to ride in three rapidly developing areas of our State. Click onto more history to discover more about our Club and it's values and activities. Our Club is fortunate to be based in an area which gives us access to explore diverse regions. We experience the natural beauty of the rugged mountain wilderness of the Scenic Rim Area, take in the rural country charm and rich historical areas of Beaudesert, or meander through the coastal recreation ares of the Redlands and Logan Shires. Good times and the bonds of friendship formed around a campfire after an exhilarating day spent in the saddle, ensures that this Club bases most of it's scheduled rides around weekend Campouts. We are a family oriented Club, and we encourage non riding family members and friends to come along and be "part of the experience", in our weekend pursuits of fun and relaxation. Regular camp oven cookouts are a feature of our camps, with all enjoying a gourmet fare amid a backing canvas of picturesque Australian countryside. The Club has a non competitive, non profit environment. 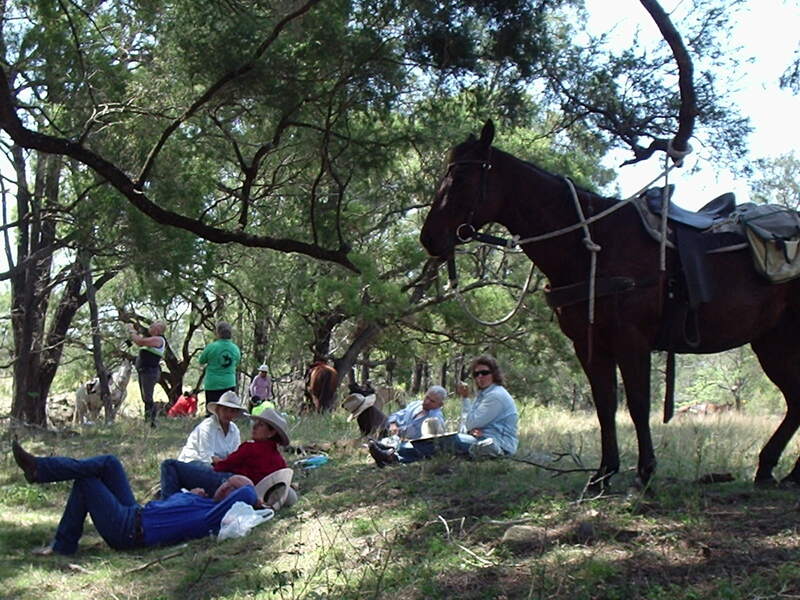 Riders new to the sport of Trail Riding receive support and encouragement from members who are willing to share many collective years of riding and horsemanship experience, whilst operating under the umbrella and guidlines of The Australian Trail Horse Riders Association. Rides and Campouts are generally scheduled on a fortnightly basis. A highlight of the years calender of events is always the week-long ATHRA Qld September Camp, with many members attending to socialize and maintain contacts and friendships with other Clubs. Several pure social evenings and car rallies are also organized throughout the year. So why not consider including the sport of Trail Riding as one of your life experiences, and be active in continuing part of our Australian Heritage for future generations to enjoy. Come along and meet some of the characters - or better still, be one of them! Make an enquiry today with Logan River Redlands Horse Trail Riding Club !